Federal Government releases forty-two-point-eight billion naira to defunct Airways pensioners and Universities – Royal Times of Nigeria. To placate members of Academic Staff Union of Universities (ASUU) who have issued an ultimatum on another round of strike action, the Federal Government has released twenty billion naira to public universities across the country for the revitalization scheme. 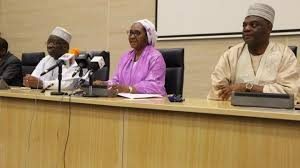 Also 15 years after liquidation of Nigeria Airways, a little relief came the way of its former staff and their beneficiaries as the Minister of Finance, Mrs Zainab Ahmed, today announced the release of twenty-two-point-six billion naira to settle half of their final entitlements. At a press briefing at the Federal Ministry of Finance, Ahmed told representatives of the staff union that the remaining half will be defrayed in the next six months. She lamented that as a result of the 15 years delay in payment, many ex-workers have been thrown out of their houses, their children have been unable to attend school, and others have lost their businesses, fallen ill or indeed, passed on. According to her, this unfortunate situation cannot be allowed to continue under a responsible administration. She immediately constituted a committee to physically verify the claims of the pensioners and relevant next-of-kin before the release of funds to the approved beneficiaries.